CLOUDS, by STUDIO Fellows James George and Jonathan Minard, is an interactive, generative, computational documentary that allows the viewer to explore different perspectives on the intersection of code and culture. 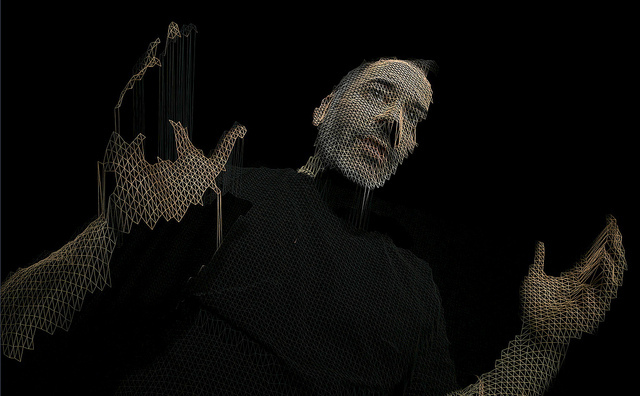 Filmed using a new 3D cinema format called RGBD and created entirely with open-source software, CLOUDS uses a data-driven “story engine” to present an endless, ever-changing conversation about the role of computational thinking in contemporary arts and design. The interview subjects in CLOUDS are an intergenerational community of more than 40 artists, designers, hackers and thinkers. They discuss the challenges of developing new forms of expression that resonate at a deeper human level. The documentary captures the story of collaboratively inventing open-source tools that form the foundation of a global creative culture. The interview subjects in CLOUDS include founders of free creative coding platforms, such as Casey Reas and Zach Lieberman, as well as critical perspectives from thinkers like Bruce Sterling, Paola Antonelli and Regine Debatty. CLOUDS is not a linear film, but a real-time executable which generates sequences of dialogue based on interactive input. Each of the interviews has been edited into individual fragments, and richly tagged. An algorithm then leaps from clip to clip, creating new conversations on the fly, while preserving continuity of ideas and themes. Viewers use gesture and spatial interaction metaphors to chart a course through the rhizomatic content space. Developed entirely with openFrameworks and other open-source arts engineering tools, the CLOUDS interviews are intercut with illustrative “visual systems”: real-time graphic modules contributed by leading computational artists and designers. CLOUDS also features a completely generative score, whose timbres and motifs are governed by the story engine as well. The project can be presented as an interactive installation, personal desktop application, or cinematic screening. The techniques explored in CLOUDS suggest a possible future of storytelling that brings interactive graphics, visual effects and cinema closer together. Interviews with the subjects of CLOUDS were collected in a new format, called “RGB+Depth”, in which traditional high-definition color video is paired with 3-dimensional point-cloud information from a depth camera. The result is a volumetric moving-image in a 3D space where virtual cameras can view the subject from any vantage point. After being recorded as point clouds, each of the artists has been given free reign to program expressive modifications of their own data, resulting in a collection of imaginative and interpretive self-portraits that straddle a continuum between realism and abstraction. The new medium of “depth video” takes inspiration from the ideas of science-fiction visionary, Bruce Sterling. In one lecture, Sterling presaged the camera of the future as a passive device for capturing all the photons in a space, turning the act of photography – selection of angle, exposure and composition – into a purely computational problem. The subsequent release of the popular Microsoft Kinect depth camera has, for the first time, made implementations of this notion attainable. To implement depth video in CLOUDS, James George and Jonathan Minard developed a wholly new cinematic capture and editing tool, the RGBDToolkit, which is available as free, open-source software.